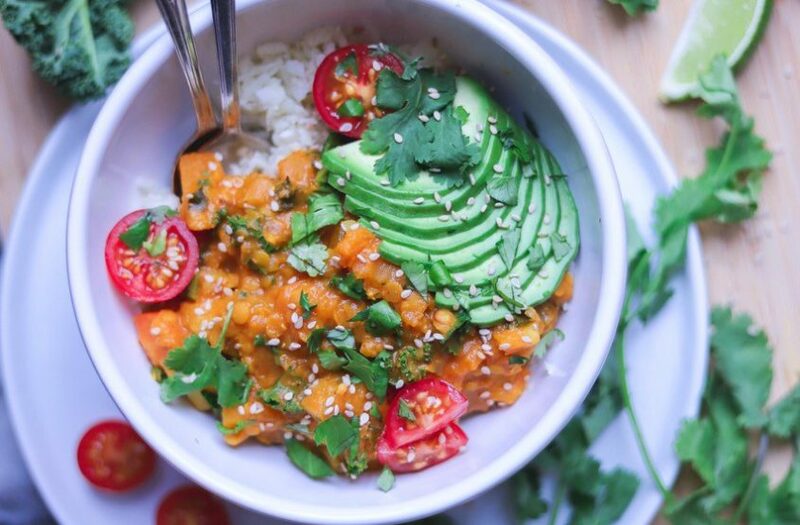 Hannah Sunderani @twospoons.ca made this delicious recipe of butternut, potato and red lentil curry with the coconut milk Ecomil. 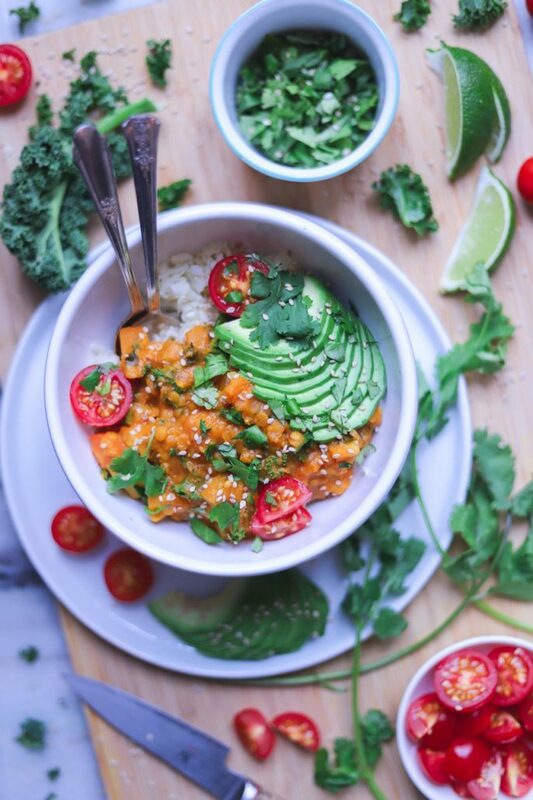 This meal is vegan and healthy and it is perfect for dinner or lunch! Serves: 6-8 | Prep Time: 20 mins | Cook Time: 30-40 mins. Dice onion and garlic and add to a large pot on medium heat. Sauté in coconut oil and a pinch salt until onions soften and become translucent in colour, approx. 10 minutes. Add the carrots and potato to pot. Cook veg for 10-15 minutes, or until they begin to soften. Then toss in butternut squash. Add a pinch of salt and continue sautéing for a few minutes longer, until squash begins to sweat. Next add vegetable stock cube, water, diced tomatoes, tomato paste and coconut milk. Pour in your lentils and stir to combine. Add your turmeric, cumin, harissa spice, and cayenne. Add a pinch salt, and pepper, and stir to combine. Bring curry to a simmer, and ensure veg is covered entirely by liquids. The liquids should be at least 1 inch higher than the vegetables. If needed add a splash more water so the vegetables are simmering in liquid. Let veg simmer for about 30 minutes, stirring occasionally, until the squash and potato are fork-tender, and lentils are cooked. Optional to add splashes more water if needed. Add the juice of 1/2 lemon, plus more if desired. Optional to also sprinkle with more seasonings if desired (cayenne, salt and pepper). When ready to serve, add two handfuls chopped kale and stir to combine. Cook for 2-3 more minutes until kale is bright green and a bit wilted. Scoop curry into bowls with cauliflower rice (see cooking instructions below) or rice of choice. Garnish with cilantro, avocado, and lemon/lime wedges. *Note: Curry will keep in the fridge for up to 5 days, and freezes well. *Make sure to dice the squash and potato very small (about the size of almonds), as this will expedite cooking. Wash and thoroughly dry cauliflower, then remove all greens and cut the head from the stem. Using a food processor with the grater attachment, grate the cauliflower heads into the size of rice, leaving any large, tough stems behind. Transfer cauliflower rice to a frying pan and press with a few paper towels, or clean dish towel, to remove any excess moisture, (otherwise the rice may turn out a bit soggy). Next, add 1 tbsp coconut oil and a pinch salt to the cauliflower rice. Bring to medium high heat and sauté the rice, stirring occasionally. Cook for 5-8 minutes. Then serve with Butternut, Potato and Red Lentil Curry. Thank you a lot Hannah @twospoons.ca !